Sleep is an essential part of our development and wellbeing. It is important for learning and memory, emotions and behaviours, and our health more generally. Yet the total amount of sleep that children and adolescents are getting is continuing to decrease. Why? Although there are potentially many reasons behind this trend, it is emerging that screen time – by way of watching television or using computers, mobile phones and other electronic mobile devices – may be having a large and negative impact on children’s sleep. The presence and use of these devices is incredibly widespread. A 2006 survey showed that nearly all adolescents have at least one electronic device in their bedroom. Given this, and the increasing exposure to screen time – particularly in the hours before bedtime – it is perhaps not surprising that screen time is now associated with insufficient and poor quality sleep. A 2014 review found consistent evidence that sleep was hampered by screen time, primarily in relation to shortened sleep duration and a delay in the timing of sleep. The latter finding was reported in 90% of the studies reviewed. But the relationship between screen time and sleep is more complex than that. Screen time could be negatively influencing sleep in many ways. The timing of screen time is one important factor. The use of these devices can lead to delays in the time that children and adolescents go to bed and, consequently, shorter sleep overall. These negative impacts on sleep can be due to screen time in the evening cutting into the time that children would normally be preparing for bed and sleeping, delaying sleep onset and reducing the overall duration of sleep. There is simply less time available for it. It has also been suggested that longer screen times may be affecting sleep by reducing the time spent doing other activities – such as exercise – that may be beneficial for sleep and sleep regulation. 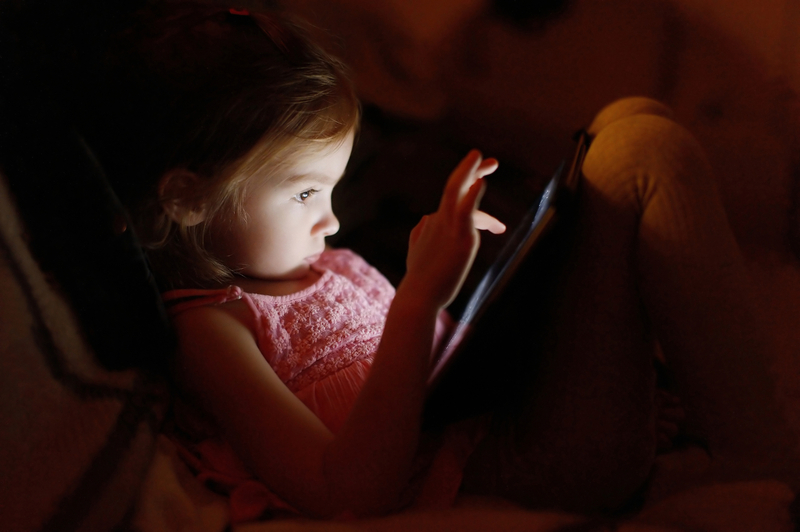 Screen time in the hours directly prior to sleep is problematic in a number of ways other than just displacing the bed and sleep times of children and adolescents. The content of the screen time, as well as the light that these devices emit, may also be responsible for poorer sleep. The content, or what we are actually engaging with on the screen, can be detrimental to sleep. For example, exciting video games, dramatic or scary television shows, or even stimulating phone conversations can engage the brain and lead to the release of hormones such as adrenaline. This can in turn make it more difficult to fall asleep or maintain sleep. Less obvious, but still just as important, is the impact that light has on sleep and on our sleep-wake patterns in general. Many of the devices that are now routinely used by our youth emit bright light. Exposure to these light emissions in the important evening hours before sleep can increase alertness. Bright light at night can also disrupt the body’s naturally occurring circadian (or daily) rhythms by suppressing the release of the hormone melatonin, which is important for maintaining and regulating our sleep-wake cycle. The number of devices and amount of screen time children and adolescents are exposed to is continually increasing. Given these early associations with reduced sleep quality, and the importance of sleep in healthy development and ageing, this is an issue that is not likely to go away any time soon. Sleep should be made a priority, and we can combat this growing problem in a number of ways. It is becoming increasingly clear that limiting screen time in the period leading up to bedtime is beneficial for sleep. In relation to this, removing electronic devices from the bedroom provides a good sleep environment and promotes good sleep practices. Although it is yet to be established how much is too much when it comes to screen time, public guidelines recommend that children under the age of 13 are limited to two hours per day, and children below five to less than one hour. There are many advantages to the advancements in technology that go alongside the exposure to screen time, such as broader opportunities for learning and communicating, and development in general. However, the worrying trend of increased screen time at the cost of essential behaviours such as sleep should not be ignored. With a more balanced approach to screen time and the use of electronic devices, the clear benefits can be obtained while still maintaining and prioritising sleep, health and development.